This is intended to be a fasttrack to get started with the Data Manipulation Classes that are used throughout the examples on this site. These classes are used to abstract data over the excel worksheet model and free the data from its physical location. You can also see the cDataSet Model here. If you just want the main utility classes used throughout this site, in the Downloads section cDataSet.xlsm includes everything you need including some examples. If you want to load these into another, or blank workbook, here's how to do it from an online repository. It will also allow you to get updates automatically. Here is the simplest framework to read a worksheet into a cDataSet object. In this case we are using most of the defaults to populate a cDataSet. It will extrapolate the likely table size and column headings from a single cell start point, with a blank row and blank column delimiting the extent of the data. This example loops through every row in the dataSet and prints the cell in the 'Total' Column of each row. By design, all manipulation is on the contents of the cDataSet, not on the underlying worksheet. This means that processing is many times faster than you are used to, and it also means that you do not need to commit the changes until everything is finished. This makes rollback very simple if something goes wrong. You just don't commit it and the worksheet stays intact. This example calculates a total column and commits the changes to that column only. You can commit the entire DataSet with dSet.Commit, but since we are only updating one column there is no point. This will check whether the stated fields are present, and complain if any are not. Parameter sheets are a useful way of providing variable data to your procedures. A parameter cDataSet gives you an very quick an easy way to devise a parameter methodology and syntax. For an example of a parameter sheet, look here. Parameters are given as a table with rows where the first column is the parameter name, and columns containing the values associated with that parameter name. For example, a parameter called Plots.Chart.Width would be on the table called plots, at the intersection of row charts and column width. cDataSets allows multiple tables on the same worksheet, identified by a unique table name, and also allows you to access a particular cell through it's name. So the value of the example parameter above would be dSets.DataSet("plots").Cell("chart","width").Value. This example creates a dataset (from worksheet "summary") and two parameter sets (from worksheet "parameters". Every object (cCell, cDataSet, cDataRow, cDataColumn, cHeadingRow) has a property .Where that contains the Excel address of the cell or group of cells. They also have a method, .Commit, which will write back that group of cells to the worksheet. You can also copy the data to a place other than the original location specified in the .Where property. For example, dSet.bigCommit Range("Contact!$a$1") will copy an entire dataset to some location starting at the given range. .bigCommit can also selectively copy certain columns, and reorder them if required. The example below checks a dataset has the expected fields, performs some calculation on various columns, writes back the changed columns and copies a subset of the dataset to another sheet, with the columns rearranged. In addition to being able to selectively copy particular columns, .bigCommit can also filter on specific values. In this example, we have a form that is being used to allow the selection of various columns to be copied using these objects. You can also specify a filterColumn and value. 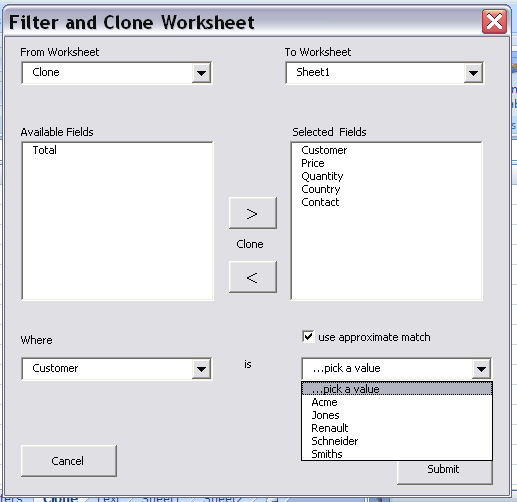 In this case only rows that match the filtervalue in the specified column will be copied. Here is the implemented form, with all fields except Total being copied and a filter in the middle of being applied to the customer column. Implementing such a form is very simple, and is completely data driven. the full example is in the GettingStarted Series download. In the example above, you can see that the filter Value combox has been populated with every value found in the Customer Column. This is easily achieved through the cDataColumn("Customer").uniqueValues property. This is how to populate the data set and return a sorted collection of cCell which hold the first occurrence of each unique value in the selected column. It is possible to return a cJobJect from a cDataSet. This is a arbitrary object that can be used to represent data of a hierarchical, or structured format. You can think of it as a 'class on demand'. The main purpose of this class on this site is to convert to and from jSon in order to communicate with web applications. cDataSet is also capable of populating from a cJobject. This means that we have a very simple way to get Excel data in and out of other web application such as Google Visualizations. In this example, we create a dataset from a worksheet, and create a copy of that sheet from the cJobject representation of that original worksheet. This illustrates the capabilty to both serialize and deserialize a cJobject. Google use this to get data in and out of Google Docs, and to communicate with Gadgets. This site has plenty of examples of projects that do this. Here is how to populate your spreadsheet with data that is intended for a Google Gadget. You can create a URL of your data in google docs , and this will get the data in real time and update your Excel Worksheet. We have all the tools now to be able to use google maps to fill in geoMapping data in an Excel Sheet. There is a full example of this here. This is a little more complex than the examples so far, but here is an example of a full application. In this case, the rules for how to interpret the jSon response from an inquiry to the Google Maps API are held in a cDataSet parameter sheet, as are the rules for how to identify the key fields needing decoded in the input address, and what kind of fields the output fields are. In future versions of cDataSet, this will likely become an inbuilt method so that mapping will become a capability of these objects. For further information, look at Data Manipulation Classes. You can also see the cDataSet Model here. Most projects on this site use these classes so you can download any of them for examples. Please provide feedback, ask questions or otherwise participate on our forum.